Inscription: Inscribed verso print in pencil: title and negative number "780". Secondary Inscription: Inscribed verso print in pencil in the hand of André Jammes: dealer's inventory number. Inscribed verso print in blue pencil in unknown later hand: "Atget" and "S. et O." [Seine et Oise?]. 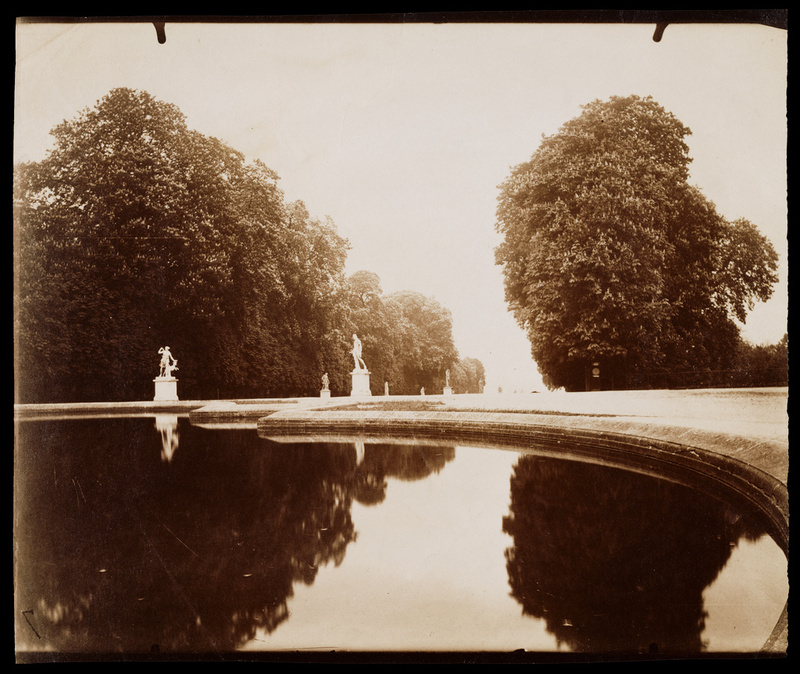 By composing this picture with the pool in the foreground, Eugène Atget created a dynamic composition that incorporates the sweeping horizontal curve of the pool's edge as well as the receding line of the trees. The pool and gardens at Saint-Cloud were originally designed for Louis XIV's brother, the Duc d'Orléans, whose landscape architect contrived remarkable perspectives by employing optical illusions. To create the effect of great distance, progressively smaller greenery recedes along the alley behind the pool. Although the royal château that once occupied these grounds burned in 1870 during the Franco-Prussian war, the gardens survived untouched. Adams, William Howard. Atget's Gardens: A Selection of Eugène Atget's Garden Photographs, introduction by Jacqueline Onassis (Garden City, N.Y.: Doubleday, 1979), fig. 25 and cover. Szarkowski, John and Maria Morris Hambourg. The Work of Atget. 4 vols. (New York: Museum of Modern Art; Boston: Distributed by New York Graphic Society, 1981-1985) vol. 3, pl. 88, for date. Baldwin, Gordon. In Focus: Eugène Atget: Photographs from the J. Paul Getty Museum (Los Angeles: J. Paul Getty Museum, 2000), pl. 28.